I was slicing lemons and trimming the ends of daffodils yesterday, then I was struck by a mad passion for yellow. Hmm. Strange. I just painted over all the yellow in my kitchen, and today I am fixated. Fickle am I. It must be my serious case of spring fever. Anyway, I got to thinking. Yellow is one of those colors that’s a little trickier to design with, but when used just right, yellow is incredibly stylish and oh so chic. Yellow is vibrant and cheerful; the color of sunshine and happiness! I think it is especially beautiful when paired with deep gray, soft green, turquoise, or white. Here’s a few examples of yellow done just right. 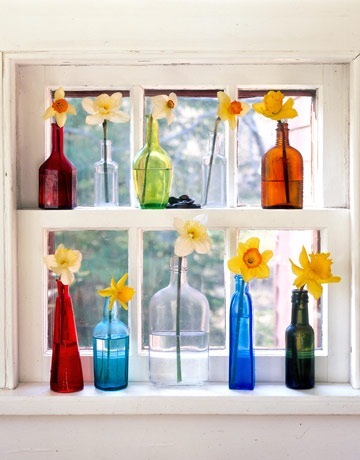 If yellow is not your preferred shade to decorate with, you can bring this cheerful color into your home temporarily with just some simple flowers . . . Does yellow inspire you ? Have you used it to decorate your home ? Funny you should blog about Yellow i plan on painting my living room yellow after i was inspired by Michelle of 3 men and a lady check her office den as she calls it that she decorated with yellow black and white! 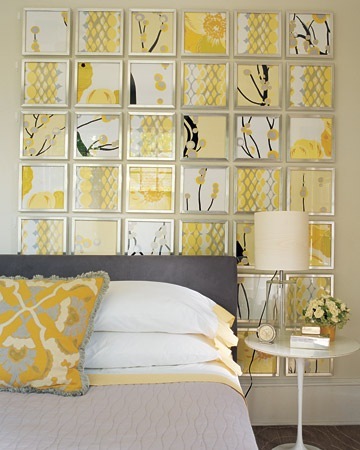 Great use of yellow….in my last home i used yellow in the living room and i loved it! Thanks for the post with so much yellow! I’m about to paint my kitchen yellow, and it was good to see some different color combinations. 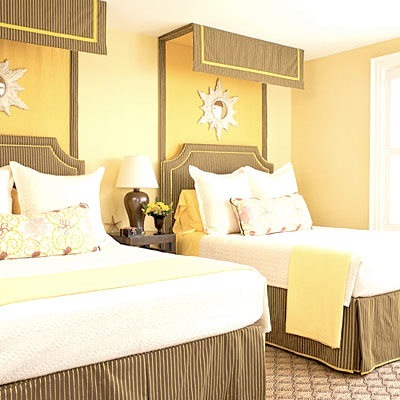 Wow, you found some beautiful rooms using the color yellow. 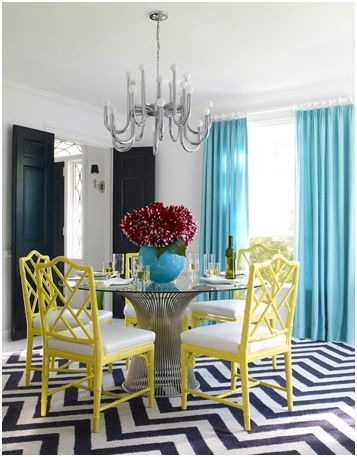 I love the dining room with the mix of black, turquoise and yellow. I’m just finishing painting my laundry room yellow, to make it bright and cheery! Oooh. I love so many of those. Yellow and black with grey is one of my faves. My guest bedroom has hints of it though that post makes me want to be more daring! I think I’ll have to see what I can come up with then blog about it. Thank you for all of those inspiration pics, Kate! That actually really helped me. I like yellow, but I can see that I should have gone bolder and maybe more golden here in the Kitchen. The shade I went with (7 years ago…yikes!) was more of a pale sunshine color, and I’m not digging it anymore. I am so hooked on yellow accents right now it’s not funny. And yellow cardigans – but only in a mustardy color. I made the mistake of painting a bad, buttery yellow in my bedroom as a kid – and topping it off with french blue molding. That’s a mistake I sure did learn from. . . Because of that I’ve shied away from yellow walls since then. I agree with Kristine – the yellow, gray and black theme is really growing on me! And I had to laugh when I saw your post this morning, because just last night I took the plunge and bought 7 yards of yellow fabric to make curtains last night! 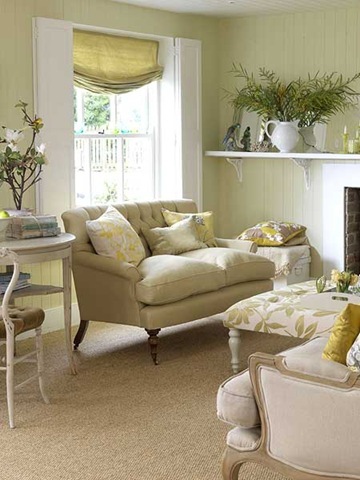 we are painting our living and dining rooms a pale yellow. the swatch on the wall looks awesome, we can’t wait to see the whole wall! 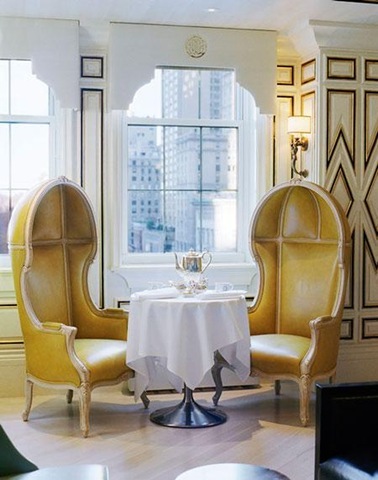 I’ve never used yellow, but oh my, how I love to see it used in other’s spaces. It does cheer the soul. You are right about getting it “just right”. Loved these pictures. Thanks. I just posted the other day about how much I am drawn to all things yellow the other day.. your post has increased that desire 1 million fold.. Thank you so much for these inspirational yellow photos. I cant even pic a favorite.. I am loving yellow right now! I’ve been lusting after a yellow bag for a couple of months, and finally found one a few weeks ago (and I’ve been carrying it every day!). I was just pining over some yellow shoes this morning. Sigh. I’m loving yellow paired with grey, it’s just so classic. I may have to incorporate yellow in my new house! Thanks for the inspiration! I just recently painted our master bedroom yellow as it is a small room with sloped ceilings and it really made it appear bigger. I purchased the Dwell Studio quilt from Target in the gray and yellow and got the fun yellow rosette pillow to go with it. Everytime I walk up there it’s like a ray of sunshine. I also wanted to tell you that your kitchen makeover is beautiful! Love the pictures! I saved a few to use an inspiration for a nursery (for my imaginary kiddo- but I’ll use them one day!). Oh yellow, let me count the ways! I love the curtains from the first picture, the coffee table from the second….oh heck, I love it all! Yellow can be tricky, it’s funny I never thought I’d live in a house with yellow on the walls, but when we moved into our house it was already freshly painted in a warm yellow and I fell in love. I get a lot of complements on in, I feel a little sheepish because I had nothing to do with it, but I sure do like it. We recently painted the nursery Ben Moore’s “Hawthorne Yellow”, which is a lovely warm shade. However, it’s tricky to match with greens (I had wanted a lime green & white roman shade). Yellow is definitely tough to get right. I like yellow-especially bright tropical yellows that remind me of the islands, I’m not a fan of the earth tone mustard like yellow. I haven’t used it yet, but I plan on making a few throw pillows in various pops of colors to toss in several rooms as I get the itch. Yellow in our grey bedroom, or yellow in our brown/blue/white living room. I too love yellow, and have just painted the powder room. 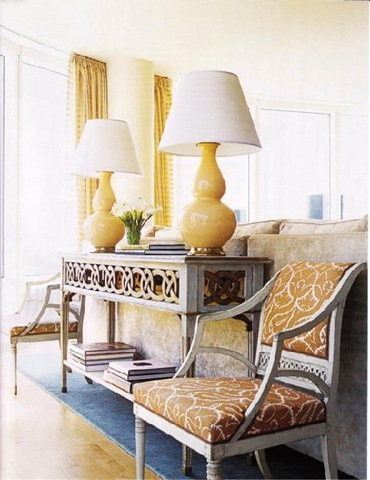 The yellow painted square coffee table is perfect!! Great images. I’ve been in such a yellow place for the last 2 weeks with all the nice weather we’ve been having. This post is welcome today. Makes me want to go buy daffodils, or, go sweep the yellow pollen off my car. Hmmm, which one? I love yellow, but in this period it’s not my favorite. Perhaps mustard yellow I’d prefer. About 5/7 years ago everything around and even on me was shiny yellow. 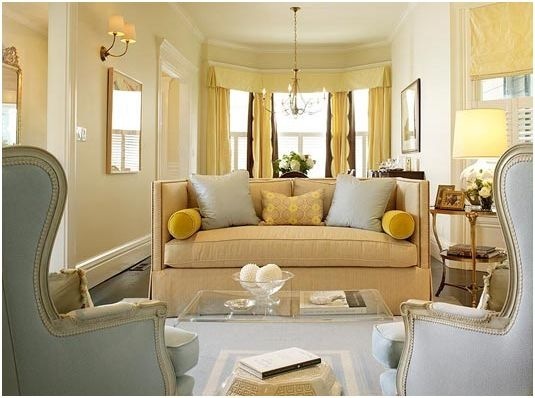 I love yellow as an accent color, especially paired with turquoise. 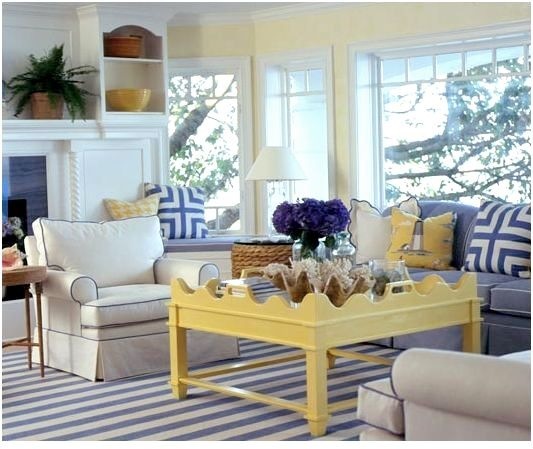 Im starting to redecorate our front room with a beach inspired theme and I definitely want to add some yellow accents. I love that yellow coffee table! It’s funny that your topic is the color yellow because I have been debating on whether or not to paint my home office yellow for months now. I am incredibly drawn to the color (our wedding, last summer, was black, white and yellow) but didn’t want the room to feel over styled or a hodge podge of yellow decor items. I want to get this space of my house right because I have a feeling I will be spending a great amount of time in my home office. Instead of painting the walls yellow (first initial thought), do you have any suggestions on bringing this color into the space so it isn’t overwhelming and easily changeable? My bedroom is at last a beautiful butter yellow. I had this color as a single gal and 9 years into my marriage I finally convinced my hubs it was a great choice for our master bedroom. I accent it with cream and black — toile and hounds-tooth – in limited amounts (so as not to over-girlie it for my husband). It is my favorite room in the house! My youngest son’s nursery has a mustardy yellow on one part of the wall, to compliment hit little buckaroom room. 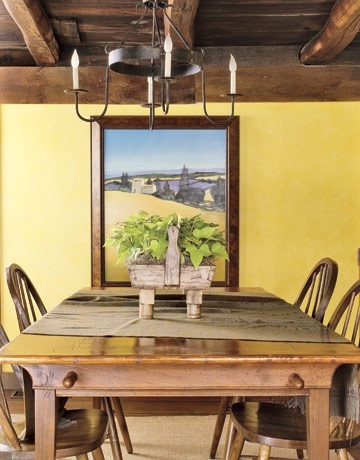 I used to have my home in many rooms painted yellow. It was called Bellisima…it was a beautiful golden yellow. Anyone who came into my home commented on it and many of my friends asked for the paint color to use it in their own homes. I paired it with warm reds, turquoise blues, apple greens and whites. I loved it. It just felt happy and cheerful. I think after many years of being surrounded by it I have welcomed the new change of doing a little yellow here and there now. I still love it, just in a smaller amount. I will be painting my family room in the golden yellow and still using my reds and apple greens. I for now am smitten with blues and whites. Funny how being a designer you just have to experiment in your colors. Mr. Wonderful did however bring me home some beautiful yellow tulips…It makes me happy to see them. 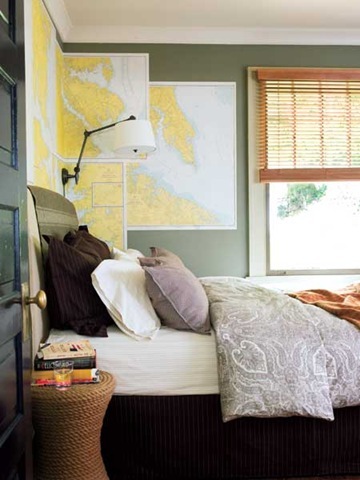 My childhood room was ALL yellow, yellow striped wallpaper, yellow comfortor from Laura Ashley, yellow accents! I loved it which reminds me and makes me want to start throwing in some yellow into our house too! I just painted my home office a mustard yellow, Behr’s Pyramid Gold. Yellow is definitely a tricky color to get right, but I’m loving my office so far! I’m pairing with white, aqua, and grey accents. I can’t wait to see it all come together! Yup I love yellow. We have Pale Daffodil by Behr in our kitchen and living room (paired with a paler yellow to break it up.) It just glows in the sunshine! We are painting our nursery for our little guy on teh way yellow and I totally agree – it’s a tricky color. U have to get it JUST right – not too dark, not too light. But just beautiful when it’s done right. Thanks for hte beautiful pics! I totally agree with you. 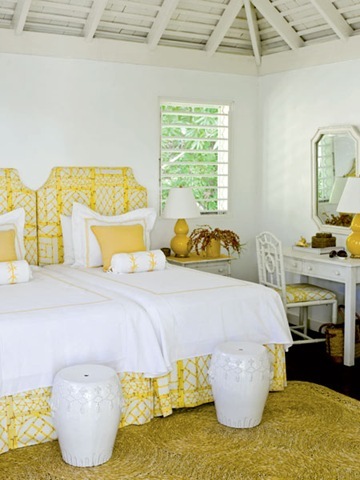 I especially love yellow painted furniture and yellow walls. I REALLY want to paint my future kitchen yellow. I love yellow. Simple as that. Cheerful springy yellow makes me happy! I just love it. But, oddly enough, I don’t do much with it, decorating-wise. Wait, that’s not true. My laundry room is painted a happy yellow. Clearly I don’t spend enough time in there. I did the yellow to decorate my girl’s room, and I still love it. It’s so bright and cheery! I am currently replacing the yellow walls in our home as well. We are putting up 2 beautiful gray’s, Benjamin Moore’s Revere Pewter HC-172 and Edgecomb Gray HC-173. Of course when you decorate with gray you need to accent it with a punch of color and one of those will definately be yellow. I have glass vases filled with lemons ready for the kitchen when the painting is done! Love the inspiration keep it coming. I just painted my spare bedroom Haystack by Martha Stewart… perfect to be the future baby’s room! :) I am OBSESSED with the color! I’ve been in love with yellow for the past year or so. I’m currently contemplating reupholstering a set of chairs in bright yellow patent! It is funny that you are posting about this given the fact that I’m trying use yellow in my master bedroom redesign. My colors (hopefully) for the room are brown, white, and yellow! I’m so excited about adding yellow because I’ve never considered myself to be a yellow kind of person. Have you seen yellow, brown, and white together? Palmer Weiss actually has the perfect combination of those colors on her site. check it out if you have time! The living room in my last home was BM’s Golden Tan – While it was subtle, I LOVED the yellow that shone through each morning beautifully. Wow – beautiful inspiration. Thanks for adding so much yellow decor eye candy. I love it paired with gray and white right now. Have a great week Kate! Yes, I do love yellow and have an obsession with lemons. 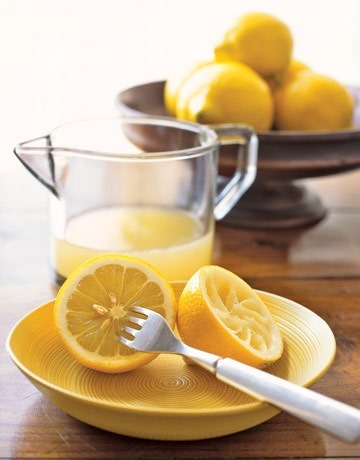 I love the look of lemons, the scent, you name it. I have yellow scattered throughout my entire house and lately have been crazy about buying soft yellow items for myself to wear. I totally hooked on gray and yellow at the moment. I used to be a huge pink fan, but lately its all yellow…lol…thanks for sharing such great pics. Love yellow and this post. Our meyer lemon tree is full of lemons too! 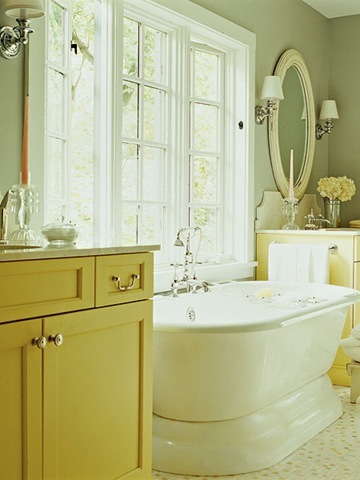 I love the yellow rooms! My bedroom is painted yellow and was in our last house too. Having a yellow bedroom makes me smile every time I walk in! Thanks for showing us all the fun color combinations! all of these images make my heart sing! I am loving all of these inspiration pics! I think just saved 90% of them to my “inspire” file. I am not sure if is because of spring, but I am loving yellow right now too! I love the tons of small framed patterns of fabric/paper. Such a good idea. Especially if you rent and can’t paint! My daughter wanted to paint her bathroom yellow. It is accented with hot pink and black. Turned out great! She calls yellow her “happy” color. It makes you feel good. Love & blessings from NC! I have 3 rooms with yellow: guest bath, laundry room & my master bedroom. Love it~thanks for sharing! I am absolutely and positively obsessed with yellow. Always have been! When I started seeing it pop up in design magazines and in stores, I was so excited! 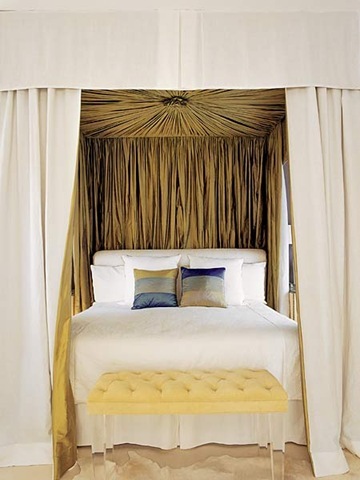 I have a master bedroom design stirring with white, chocolate, pale grey, and yellow. I may add pops of kelly green, but I may also be losing my marbles. :) Happy decorating and thanks for the inspiration! I like yellow but not in my own home.It is just one of those colors that I grow tired of very quickly. I find myself turning to yellow more and more in my decor. I love the warmth and that sense of sunshine in my rooms even on dreary days. I L-O-V-E that photo of the Country Living bathroom with the sage green walls and golden vanities. Gorgeous! How beautiful! I love the greys, greens, & yellow. I current;y live in a rental that has a yellow kitchen that I’m stumped as to how to decorate. So far I’ve stuck to sages & some red & burnt oranges. 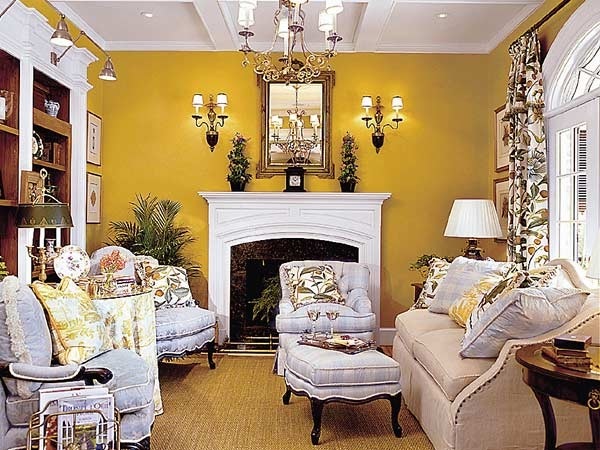 What month was the chartreuse colored living room in Southern Living magazine? I would love to find out the exact color and brand paint. I love golds and yellows too. (along with other colors) I have a gold family room, warmer but as intense as a school bus. It is so cozy and warm feeling- love it- with Navy and slate blue accents, off white woodwork…. We used to have a yellow walls in our dining room kitchen and hallway, with an avacado feature wall & aubergine cabinets in the kitchen. Everybody who visited loved it. The inspiration came from placemats and coasters I fell in love with. Metallic tile splashbacks kept it looking edgy. You really make it seem so easy together with your presentation however I in finding this matter to be actually something which I believe I might by no means understand. It seems too complicated and very wide for me. I am looking ahead on your next post, I will try to get the dangle of it! Yellow is one of the brightest colors. Having this shade in your house, whether on walls, furniture pieces or decorations can truly make your home look so sunny and stylish. Those photos are really motivating. I like the one with the combination of gray and yellow. It looks so clean and relaxing to the eye.